Charming, quaint, romantic, historic landmark wedding chapel. Gorgeous stained glass windows throughout. 150 year old bell to ring announcing your marriage to the community. 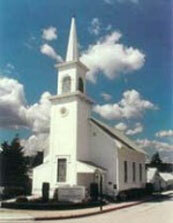 Very reasonable wedding package includes wedding ceremony coordinator, minister, and organist. Beautiful sanctuary and courtyard for wedding photos. Sanctuary holds up to 132 people. Call Janice at 831-915-2771 for more details.